For eight-and-a-half years my family has been among the relatively few “Continentals” to live on St. John. With more than 60 percent of the land a national park and much of the remaining terrain too steep or inaccessible to develop, the island can only accommodate a handful of full-time residents: about 4,500 at last count. During our time on-island, we were privileged to be part of both the Coral Bay sailing and Virgin Islands National Park communities. We were fortunate to have sold our sailboat well before Hurricane Irma decimated the fleet. 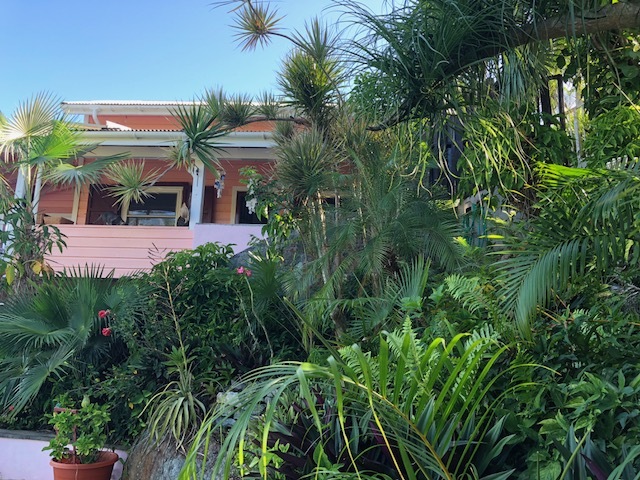 And, after a bitter sweet and hectic three months of storm-damage repair and offering our Gifft Hill home on the real estate market, we found the perfect buyer in a long-time St. Johnian who values our lush tropical plants and trees and the bird habitat they afford. To islanders, the progress made in the seven plus months since the apocalyptic visit by two category five hurricanes (Irma and Maria) is encouraging. Long-time residents are accustomed to making do in a world characterized by local government dysfunction and frequent outages of power produced by a utility that was managerially challenged even before the storms. 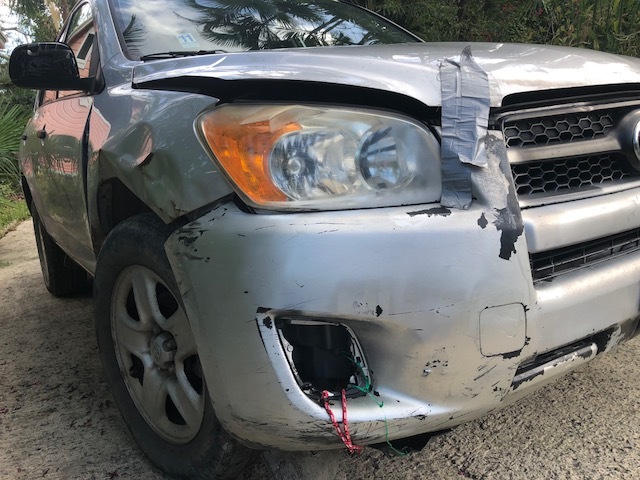 Bald tired automobiles held together with wire and duct tape are taken for granted by hearty Virgin Islanders now accustomed to shortages of parts and tires. People mostly accept the high prices of essential items caused in-part by inexplicable customs duties levied upon products “imported” from other parts of the United States. Overcoming hardship breeds a special camaraderie and esprit d’ corps among locals that most visitors who come for the spectacularly beautiful scenery and beaches cannot comprehend. Tourists are often unaware of property managers’ herculean efforts to maintain, prepare, provision, service private generators and fill depleted water cisterns of accommodations. The same can be said for owners of car rental businesses who somehow keep fleets of jeeps running despite pot holed, post-storm roads on which broken glass and nails are not uncommon. I salute Virgin Island property and business owners with the grit and determination to “tough out” these hard times to prepare for better days ahead. There are many examples. In a past column, I wrote about the owner-operator of Cruz Bay based St. John Ice and Water Co. who continues to produce clean, pure desperately needed products, even as demolition of the heavily damaged “Lumber Yard” buildings housing his plant proceeds. He was open every day throughout the storms and is determined to remain open every hour until the structure is pulled down around him. A similar determination can be seen in Coral Bay where it’s hard to reconcile the ghastly heaps of debris and untouched, storm ravaged buildings with undiminished community spirit and optimism. Consider the example of Colin Hanson who recently got married, bought two power boats to charter and is restoring the locally famous S/V Breath on which he resides in Coral Harbor. My family and I first met Colin when he was the young captain of the Breath – built and then still owned by legendary sailor Peter Muilenberg. 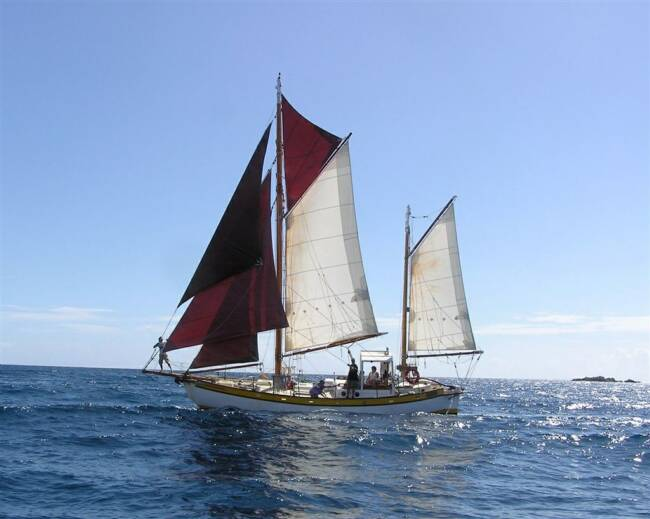 A classic 42 foot gaff-rigged ketch, the boat was hand crafted on a Coral Bay beach by Peter and friends more than 30 years ago. It remains the largest boat built on St. John in modern times. Sadly, ill-health led Peter and his family to sell the Breath to another person and move to the mainland. Captain Colin Hanson focused his energies on his own boat, a wooden schooner named Buxom. In the intervening years, the Breath was mostly idle at her mooring until Irma threw her ashore on the rocks. Buxom sank and was beyond salvage. In the weeks following the storms, Colin and his girl friend moved to the mainland and got married. In a burst of faith and vision, they moved back to Coral Bay, acquired the wreck of the Breath, patched an eight foot long gash in her hull and have been working to restore her ever since. In the spirit of the islands, he plans to replace her shattered mizzen mast with a discarded, wooden electric pole that he will mill to fit by hand. We last saw Colin and his wife Leah when they visited our house to pick over household goods we couldn’t move back with us to Virginia. I was pleased he could use a solar panel on Breath’s deck and my wife Martha was delighted Leah could use a variety of dishes, fabrics and other supplies. They loaded them into a suitably battered SUV with missing side windows and a variety of dents and gashes. Before Irma, Colin had parked the car for safety on top of Bordeaux Mountain. After the storm, he found it had been blown on top of a nearby destroyed restaurant. They were able to get it down and running and back to Coral Bay where it was stolen, but later recovered. There are hundreds of other stories of Virgin Islanders’ quiet courage and faith. Tragically, though, many families have had to move in search of functioning schools and health care services. Seven months following the storms, it is shocking to see still shattered schools and inadequate health facilities. Even before the storms, the V.I. hospitals had lost accreditation. Returning from islands of diminished resources and expectations to a land of cheap electricity available on demand and abundant clean, fresh water was a bit jarring. The well maintained roads, efficient government service, overstocked supermarkets and tidy towns Virginians take for granted are scarce in America’s Caribbean island territories. Publishers Note: We regret that this will be Jeff’s last contribution to the Caribbean Connection since he has moved back to the Commonwealth. We are hoping to use his writing talents in other areas. We are in search of an “on-island” contributor and look forward to introducing you all next month.